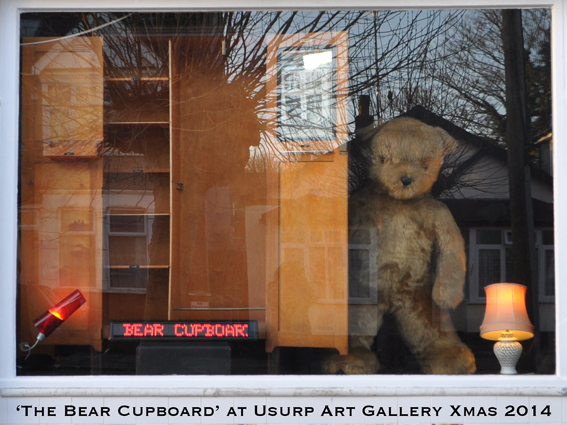 Usurp Art Gallery presents ‘The Bear Cupboard’ our alternative Christmas window display. As an antidote to the extravagant and opulent displays offered by large department stores, ‘The Bear Cupboard’ highlights the stark and impoverished Christmas facing many people living in Britain today under this government’s punitive austerity program. 13 million people live below the poverty line in the UK. Every day people go hungry for reasons ranging from redundancy to low income. Foodbanks are a lifeline, providing emergency food and support to people experiencing crisis. In 2013-14, foodbanks fed 913,138 people including 330,205 children.